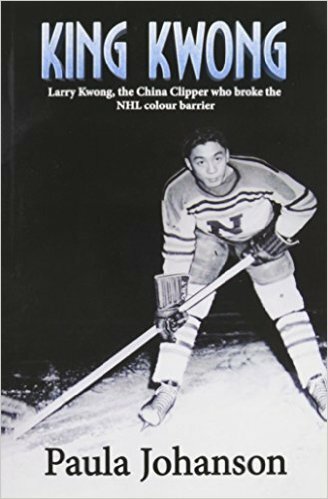 It was a great experience, writing a biography of Larry Kwong, the star hockey player who was known as the "China Clipper" back in the day. 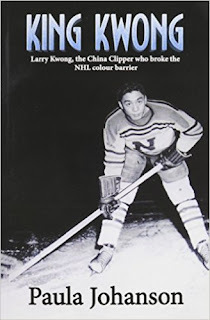 (Click here for a link to my website's Biographies page and scroll down a little to read all about King Kwong.) Since then, I've been keeping up on the news about him. 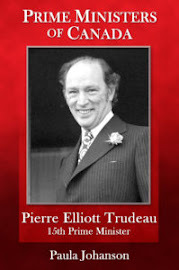 He's in his nineties, and there's still news about him, or connected to him. Hi Kristina, Last weekend your grandfather was in the Vernon Winter Carnival parade! This poster was part of the museum's float which won Best Overall. The photo will now be displayed at City Hall. Also, your family will be included in a new museum exhibit called "Gold Mountain Dream," a joint project with the Royal BC Museum, from Oct. 16-Feb. 28. Context is everything in biographical studies! 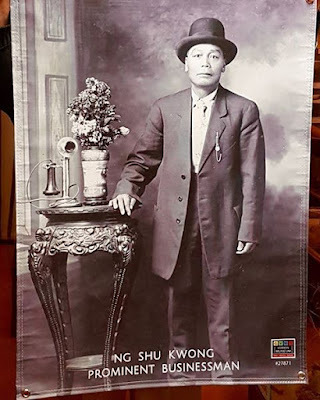 It's terrific to see Larry Kwong's father celebrated as a "Prominent Businessman" from the history of the city of Vernon. And now I've got another reason to visit the Royal BC Museum in the fall, to see the exhibit.